By Ross Tillman, P.E., Bolton & Menk, Inc.
Have you ever driven through an intersection and wondered, “Am I lost?” Signing and roadway design may have forced you to drive “out of your way” to make your desired turn. You may have even found yourself asking the question, “Was I just driving on the wrong side of the road?” If any of these thoughts has ever crossed your mind, you likely encountered one of many different types of reduced conflict intersections. What is a reduced conflict intersection? As the name implies, these designs reduce the number of conflict points, or locations where vehicles are exposed to potential collision with another vehicle or pedestrian. The reduction in conflict points is intended to increase safety by preventing certain crash-prone movements from occurring at the main intersection. These movements are thereby converted into movements less likely to result in a crash. Some designs attain a similar safety benefit by shifting traffic making higher risk maneuvers (i.e. left turns) to locations with less conflicting traffic. There are many varieties of reduced conflict intersections and interchanges, from simple right-in/right-out intersections to complex interchanges. The Federal Highway Administration discusses six in the report titled, Alternative Intersections/Interchanges: Informational Report (AIIR). Displaced Left-Turn -- Shifts left turns to secondary intersections approaching the main intersection and therefore simplifies signal timing at the main intersection. Median U-Turn -- Allows only through movements and right-turns at the main intersection. Left-turns are accomplished by turning right and making a U-turn. If signalized, the main intersection and U-turn locations (if necessary) can operate as simple 2-phase signals. Restricted Crossing U-Turn -- Similar to the Median U-Turn, however the main intersection geometry allows left turns from the major street and prevents crossing movements from the side street. Quadrant Roadway -- Creates a roadway connection through one or more quadrants of an intersection to relocate major turning movements away from the main intersection, therefore simplifying signal operations at the main intersection. Double Crossover Diamond (Diverging Diamond) -- Flips traffic to the opposite side of the road (drive on left) which allows left-turns to and from the highway to turn left on red, similar to a left-turn from a one-way street to another one-way street, or to be controlled by yield signing. Displaced Left-Turn -- Similar to the displaced left-turn at-grade intersection, however modified for use at ramp terminals. Each of these designs -- whether for an intersection or interchange -- is meant to either reduce conflict points or displace riskier movements to lower volume locations. Additionally, these treatments often result in reducing traffic signal phasing complexity by removing some or all of the protected left-turn phases from the main intersection. 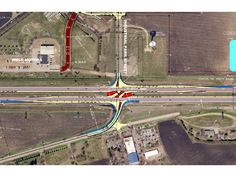 A local example is the intersection of TH 169 and CSAH 28 in the City of Le Sueur. The intersection was recently converted to a Restricted Crossing U-Turn (RCUT) intersection in 2015. The area adjacent to the intersection was planned for development including commercial, industrial, and residential land uses. Rather than construct an interchange, the project team determined an RCUT could be utilized as a lower-cost solution to provide safety and traffic operations benefits while preserving previous investments made along TH 169. Reduced conflict intersections come in many shapes and sizes, and therefore are able to “fit” a wide array of locations, project types, and funding sources. These intersections are tools every transportation professional should add to their toolbox.